Yes, I know I've been MIA in the blogosphere lately. But I've been wonderfully busy preparing for classroom visits and then visiting those classes! It's really been a fun week. Thursday, I had a skype visit with the sixth graders at Wentzville Middle School in Missouri. The english teacher has been reading A Dog's Way Home to her classes over the last several weeks, so the students had a good grasp of the book--essential for a skype visit. I talked with the kids about how I became a writer, what inspired me to write this book, and then some different elements of the book, such as why I chose the setting (North Carolina) I did, and who or what the antagonists are in the book. The kids very astutely fingered nature as Tam's antagonist. I wish I had allowed more time for the Q&A session. The kids really had great questions! Of course, the highlight of the whole presentation for the kids was when they got to meet my two shelties, Teddy and Sherlock (Boo hates to be held). The minute they saw Teddy's face with that white star on his head, they said, "It's Tam!" I know some authors are not comfortable with skype visits. But even being the technophobe that I am, I think it's such a great way to connect "live" with readers you normally wouldn't be able to. Today I had a "real" school visit at one of our local elementary schools. The kids--3rd through 5th graders--were terrific. I'd made myself learn power point (can you believe it?) for this, and it worked (mostly) like a charm. Given the fact that A) there were probably 80-100 kids and B) many of them probably hadn't read the book, they were very attentive and engaged. And again, they had some great questions at the end! They were all pretty united in the opinion that since A Dog's Way Home was inspired by and written for Teddy and Boo, it's now Sherlock's turn for a book! And I think they're right! That's something I've always wondered about my dogs. I know their hearing is a zillion times keener than mine. Boo can hear the breathing and scratching of mice beneath the deep snow. Sherlock can here the soft rustle of a plastic bag from a dead sleep in another part of the house. Teddy, well in truth, Teddy doesn't hear much of anything anymore, bless his heart. What must it be like to live with those ears, that hearing? I pondered this daily as I wrote Tam's chapters in my book, A Dog's Way Home. What did he hear in the forest as he made his way home to his Girl? Fido and Friend in Five: Hilary Hyland, Teddy, and Ethie! I just have to say, I LOVE Newfoundlands. 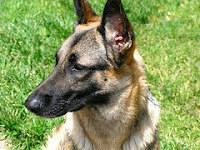 Sure they're huge and drool a lot, but you will rarely meet a sweeter, gentler breed. At the library where I work in Salt Lake City, we have a Newfie who comes to the library once a month for the kids to read to. The kids line up for a chance to read to Bucky! So I was very happy to find this wonderful book, The Wreck of the Ethie, about a brave Newfoundland. I was thrilled when the author, Hilary Hyland, agreed to stop by for a chat on Fido and Friend in Five! The multi-award winning The Wreck of the Ethie was inspired by the true story of the 1919 sinking of the ship, the Ethie. Because of one very determined and brave Newfie, ninety-two people were saved, including an 18 month baby who was saved in the ship's mail bag! Of course, this is what Newfie's were bred for: to rescue people at sea. They are terrific swimmers and have big, webbed feet! So let's meet Hilary and Teddy and Ethie! 1. How did you and your dogs find each other? I have two (150 pounds each) Newfoundland dogs. Ethie (named after the ship wreck) came from a Canadian Newfoundland breeder. Ethie flew into the U.S. on Air Canada and believes with all her heart that the entire world should revolve around her. Teddy Bear had been starved and abused. The Newfoundland Rescue League saved him and he came into our lives when he was two years old. Typical of the breed, both are sweet, gentle, and love children. Which comes in handy as they alternate going on author/school visits with me. They are a BIG hit with the kids and perfect ambassadors for the breed. 2. What makes Ethie and Teddy's tails wag? WATER! More water! Water for swimming. Lake, river, ocean, Barbie pool, sprinkler. After all, they must always be on alert to save some hapless soul from drowning. Newfs have a natural instinct for water rescue, and there are many true stories about their life saving abilities. They are the most powerful swimmers in the dog world and have huge, webbed paws. 3. What's your all time favorite dog story? This is harder than a calculus question for me! There are SO many terrific dog stories. I'm wringing my hands...only one? Okay, perhaps, Lad: A Dog by Albert Payson Terhune. Let me also sneak in my favorite picture book, Riptide, by Frances Ward Weller. 4. If your dogs could change just one thing about you, what would it be? They would change where I live. Although it's quite lovely here in Virginia, they'd prefer we move to the ocean or a lake. 5. In five words, tell us what Ethie and Teddy Bear mean to you: Love, love, love, love, love! Hello blog friends! I've been out of town for the last several days in The Den of Iniquity--otherwise known as Las Vegas! What, you may ask, was a nice, quiet librarian/children's author doing in Las Vegas? Actually, I found myself wondering the same thing! But I'd 1) never been there before and 2) was DESPERATE to get away from snow and cold and 3) was kidnapped by a friend. I will sum up by saying one time in Vegas is enough for me. Still, it's an interesting place. I mean, where else but in Vegas will you see an Elvis impersonator taking a picture on a street corner of Micky and Minnie Mouse?! Efie is bowled over by my book! Thanks again, TK and Efie Loo! Good News and Good Poem! Well, today I can finally let the cat out of the bag: I have a new book coming out! The title is (at least for now) Mercy's Bone, and it will be published in Fall 2012 by Arthur A. Levine Books! I am very excited and honored to have the opportunity to work with Arthur Levine who is, well, legendary. Mercy's Bone is for (approximately) grades six and up--although I think it will have "cross-over appeal" to adults as well. It takes place in Russia in the mid-1990s, after the fall of the Soviet Union. 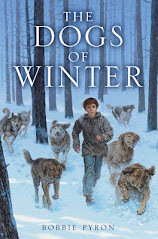 It was inspired by a true story of a young homeless boy who survived the winters and streets of Moscow because of a pack of feral street dogs. The chairs and beds are mine, too. Fido and Friend in Five: Allie Larkin, Argo, and Stella! Many years ago, after a particularly onerous divorce, a friend of mine gave me a mug that said, "The more I know men, the more I love my dog." Too true! And that could certainly be the motto of the heroine in Allie Larkin's charming debut novel, Stay. After having her heart broken too many times in too many places, Savannah Leone has her heart mended by Joe, a 100 pound German Shepherd Dog. 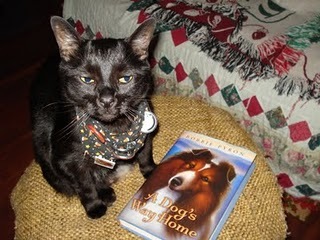 After I read Stay, I decided to contact Allie to see if she'd like to be spotlighted in Fido and Friend. I was delighted she was willing to take time out of her busy schedule! Allie is not only a writer, she is co-founder of TheGreenists.com www.thegreenists.com a website dedicated to helping readers take simple steps toward going green. 1. How did you and your dogs find each other? We got Argo through an acquaintance. Stella came to us because the kennel where we board Argo knew she needed a home, and asked us if we'd be interested in adding another German Shepherd to our family. She was a wild beast for the first month or so, but eventually calmed down and turned into our funny, sweet Stella. I couldn't imagine life without her! She and Argo are best buds. It makes me so happy to see them play together! 2. What makes Argo and Stella's tails wag? Both Argo and Stella wag their tails when we talk to them. It's so cute! And nothing makes Argo happier than playing frisbee. 3. 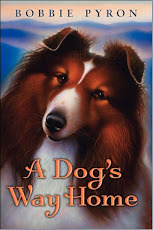 What are some of your all-time favorite dog books? I loved Call of the Wild when I was younger. When I was eight or nine, I was completely obsessed with a cartoon called Belle and Sebastian, about a boy and his dog in the Pyrenees mountains. It was based on a series of books by Cecile Aubrey. 4. If your dogs could change just one thing about you, what would that be? I think Argo would rather I didn't work. He'd be happier if my official job title was Retriever of Dog Toys from Under the Furniture. 5. In five words, tell us what Stella and Argo mean to you: unconditional love, loyal friendship, joy. 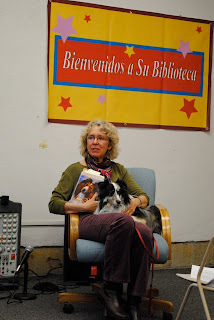 Last night, I helped the Park City Library celebrate National Library Week with my sheltie, Sherlock. 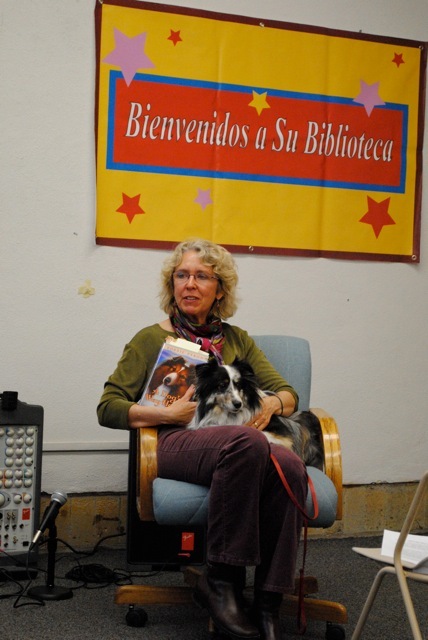 I not only talked about my book, A Dog's Way Home, but I talked about the importance of libraries in my life. Of course, since it's also National Poetry Month, I had to read Mary Oliver's poem, Percy and Books (which I posted last week on this blog). Anyway, since most of you couldn't be at the Park City Library last night, I thought I'd share with you my talk about libraries. It's a particular pleasure for me to be here to kick off National Library Week. As some of you know, in my other life, I'm a librarian--I've been one for an embarrassing number of years. I'm also on the board of the Park City Library, so my commitment to libraries runs deep. And long. When I was a kid, we moved a lot. My mother and my sister thought it was all a grand adventure to move on to the next place, where things would undoubtedly be better. But not me. I was a shy, sensitive child who craved permanence and stability. I did not make friends as easily as my sister did. My best friends were of the four-footed variety, and were also characters in books with names like Pippi Longstocking, Lassie, and others. As soon as we'd move to a new town, unpack the car and our few belongings, I'd head to the public library. There I knew just how the books would be arranged on the shelves and how the place would smell, no matter if we were in Destin, Florida or Dawson, Georgia. When I walked through that front door of whatever library it was and smelled that musty, sweet bookish smell, I knew I was home. As a child, libraries--both public and school--provided a secure place for me, no matter where I was. And books helped me make sense of the world and not feel so alone. A lot like dogs, now that I think about it. As a writer, libraries and books helped me tell my own stories. For both of my books, The Ring and A Dog's Way Home, I spent hours and hours of time in the library doing research to make my books (even though they were fiction) ring honest and true. I read books by authors who wrote on the same subjects I did--authors like Chris Crutcher, E.L. 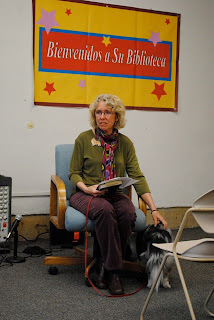 Going, Kate DiCamillo, and Cynthia Rylant--for inspiration and courage. I could not imagine being a writer without being a reader. And I could not be a reader without libraries. I doubt many of us could. I love it when my favorite fiction authors also write poetry--as long as they do it well. Not all do, or can. Or should, for that matter. One of my favorite authors of adult fiction is Jim Harrison. You know him as the author of such classics as Legends of the Fall and my personal favorite, Dalva. But did you know he also writes and publishes poetry? And just like his fiction, his poems are wonderfully earthy, humorous, and gorgeous--maybe even more so. Jim is also a huge fan of dogs. His essays about them have appeared in magazines such as Sports Illustrated and Bark Magazine. So in celebration of National Poetry Month and all things dog, I give you one of my favorite poems by Jim Harrison. in dog years I'd be seven, not stray so far. my age was the King of New Guinea in 1343.
the pain of the schizophrenia of kingship. To them I am pretty much a fellow creature. 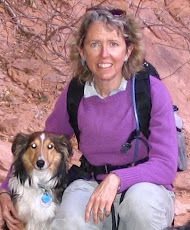 Fido and Friend in Five: Kate Jackson and Dixie! 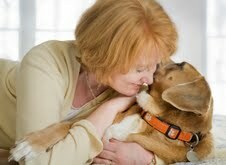 I am so pleased to have this very special guest in the Fido and Friend spotlight this week: an editor and her dog! Editors are, needless to say, the life blood of writers. That may sound like an overstatement but it's true: no editor, no published book. Editors are the instrument that polishes our diamond in the rough--and not only polishes but elevates our work beyond what we thought we could do. 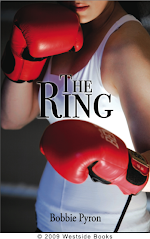 I have had the great good fortune to work with two such editors--Evelyn Fazio (WestSide Books) on my first novel, The Ring, and Molly O'Neill (HarperCollins/Katherine Tegen Books) on A Dog's Way Home. Kate Morgan Jackson is editor-in-chief at HarperCollins Children's Books, a job she describes as "the best in the world. Working with an incredible array of authors, artists, and editors is a gift, pure and simple, and fills my days with fun complications of the best kind." You'd think that and taking care of her family would be enough to keep Kate busy, but no. This woman is also an amazing photographer, passionate dog rescuer, and a gourmet cook. All this has led to a whole other life Kate leads away from her desk at HarperCollins. "Somewhere along the line, these two interests (food and photography) crossed paths and turned into a cooking blog called Framed Cooks www.framedcooks.com . And what a roller coaster ride it's been!" If you visit her blog, you'll see not only delicious photos she's taken of the food she cooks, but also photos she's taken of babies, teenagers, and rescue dogs--all things she loves with her trademark passion. You'll also find wonderful recipes on that blog too. 1. How did you and Dixie find each other? Dixie came into our lives when we finally said yes to our daughter's daily pleas for a puppy. We adopted Dixie from the Aunt Mary's Doghouse www.auntmarysdoghouse.com rescue program when she was just ten weeks old--we walked into the shelter and Dixie literally jumped right into Emma's lap. After three years of Dixie, I can't remember what life was like without her. She is a noisy, ravenous, gorgeous, messy conglomeration of rambunctious love! 2. What makes Dixie's tail wag? Besides absolutely any kind of food, you mean? Dixie loves people. Nothing makes her happier than the sound of the doorbell...that tail wags so fast and furiously that I think one of these days it's going to levitate her into the air like a helicopter. My biggest challenge with Dixie is trying to teach her that as much as she wants to launch herself into the arms of whomever is walking in the door at 100 miles an hour, the person might not feel the same way. But her great big doggie heart is in the right place. 3. What's your all-time favorite dog story? One of the most amazing experiences of adopting Dixie was that my daughter, Emma--then an 8th grader--became an evangelist for dog adoption. 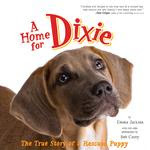 She learned so much about all the dogs our there in dire need of homes, and dedicated herself to spreading the word in that relentless, wonderful way kids-on-a-mission have As a result, Emma wrote a picture book called A Home for Dixie. It's illustrated with with beautiful photographs of Emma and Dixie by the terrifically talented Bob Carey. Emma and Dixie went on a tour of school, libraries and bookstores to talk about the book and the importance of adopting rescue dogs. They even appeared on The Today Show! Emma donated every penny back to the shelter where we adopted Dixie. It was an incredible experience for our entire family...and as a result, it's definitely my favorite dog story! Watch Emma and Dixie on The Today Show here Emma Jackson "A Home for Dixie"
4. If Dixie could change just one thing about you, what would it be? It would be a toss-up between feeding her more than twice a day (I think 20 times a day would be A-Okay with her), and spending more time with her. I get home from work at the end of each day, and she's faithfully sitting by the door waiting for me. My daughter tells me that she takes up her position by the door about an hour before I get home, and when I walk in, she's vibrating with happiness to see me. On the days I work late, I get a pang of guilt thinking of Dixie sitting there wondering why I'm not walking through that door. 5. In five words, tell us what Dixie means to you: Unconditional, exuberant, faithful, noisy LOVE! Mary Oliver is, well, a rock star among poets. I'm not kidding! When she holds a public reading, hundreds of devotees turn out. They clap, they hoot, they hold up lighters and sway back and forth as she reads her poetry. Okay, I'm kidding about the lighters, but the rest is true. And how cool is that? I love Mary Oliver too. 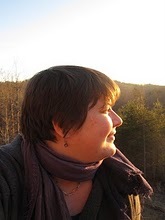 Like Kenneth Brewer, she writes luminously about nature, and the nature of nature. She explores the dark side of human nature and things like death and apathy and cruelty. But by far, everyone's favorite poems of Ms Oliver's are what are known as her "Percy Poems," a cycle of poems inspired by her little, white rescued Bichon. Oliver has said part of what she loves so much about dogs is that, unlike the poet, they live the "unexamined life" with great joy and no guilt. What a gift! The tide is out, and the neighbor's dogs are playing. Books? says Percy. I ate one once, and it was not enough. Let's go. One thing my lovely editor, Molly O'Neill, and I have in common is a passion for poetry. On her blog, Ten Block Walk www.10blockwalk.blogspot.com, she often includes poetry. 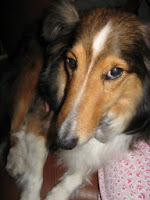 So in honor of her and in honor of National Poetry Month, I'll be posting poems this month about (what else) dogs! Because really, what's more poetic than the sight of a dog running through a meadow or the way he looks at you with such ardor. Just imagine the poetry Emily Dickinson might have written had she shared her life with a dog! So to start off, I'm going to share with you one of my favorite poems about dogs. I love it so much, I have it pinned to my bulletin board in my office. It has inspired me in many way. The poem, Why Dogs Stopped Flying, was written by Kenneth Brewer. Kenneth was a retired professor of English, and Utah Poet Laureate until his untimely death from cancer in 2006. His direct, spare, often sardonic poems celebrate the land and its creatures. He is certainly one of the finest poets of modern time to come out of the West.